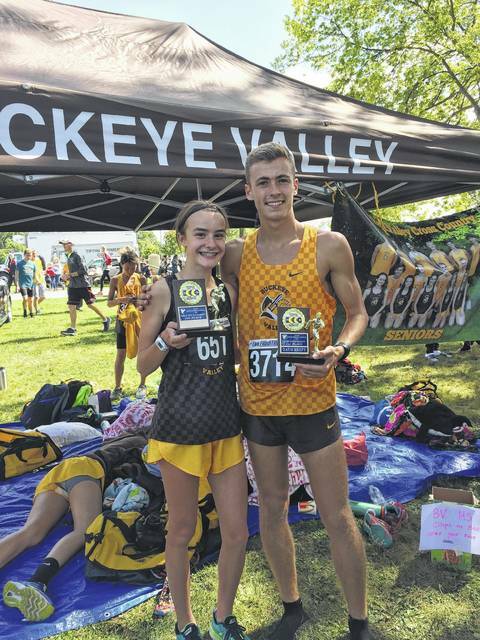 Don’t let the Buckeye Valley duo of Chloe Dawson and Zach Kreft fool you … winning the Tiffin Cross Country Carnival isn’t easy. For Dawson, it took a record-setting showing. The freshman broke the Buckeye Valley school record — a mark held by Jenny Brooks since 2001 — with an effort of 18:21.7. Brooks’ mark was 19:15. Dawson beat out runner-up Ashley Rulison (Beaumont) by almost nine seconds. Kreft, another BV school-record holder, has won a lot of big races in his career. He is, after all, the defending Division II state champ. He’d never won at Tiffin, though … until Saturday. The senior ran a controlled race the first two miles before opening up and pulling away in the last mile, winning by 25 seconds in a time of 15:10.3. “It’s pretty special to have two individual winners at Tiffin … and both school-record holders on the teams in the same year,” BV coach Nate Ritz said. The Baron boys finished seventh among the 47 teams in action while the girls closed eighth of 27 in their division. Nathan Holst finished 23rd (16:52) and Gavin Shearer closed just behind him in 24th (16:53) to boost the boys. Baily Kreft and Chayse Arnhold smoothed out the top three for the Baron girls, finishing 45th and 54th in respective times of 20:49 and 21:04. Olentangy Orange was also at Tiffin. The Pioneers’ boys finished eighth in the Division I race. Tommy Wintering led the way, finishing eighth among individuals with an effort of 15:53.3. The girls, meanwhile, finished 10th thanks in part to Lindsay Ott’s 20th-place performance of 19:50.7. Lauryn Rocassin did a little bit of everything Saturday, collecting eight kills, 11 digs, 12 assists and four aces to lead Hayes to a three-set win over host Marion Harding. The Pacers won the first set 25-14 before sealing the deal with respective wins of 25-16 and 25-9 in the second and third. Hadlee Bruns was also solid, closing with seven kills, two blocks and four aces, while Sydney Krewson had three kills, eight digs, a block and two aces. The Eagles never quite got rolling Saturday, falling on the road in three sets. DCS got better as the match wore on, but lost 17-25, 20-25, 23-25. Lyssi Snouffer led the way with nine kills and 15 digs while Anna Fuller finished with a team-best 16 digs and three aces. Erin Bauslaugh also had a nice afternoon for the Eagles, finishing with 17 assists and 10 digs. The Pioneers picked up a solid non-league win Saturday, beating the defending Division II state runner-up Hawks in five sets. Orange won each of the first two sets 25-17 before Hartley won the next two 25-17 and 25-18. The Pioneers got back on track in the fifth, though, winning 15-11 to cap the win. It was a total team effort for Orange, which had six players finish with at least seven kills. Carrigan O’Reilly finished with 45 assists while Megan McCollum anchored the defense with 29 digs. Cassidy Ryan and Payton Kaufman each found the back of the net to lead Olentangy Orange to a 2-1 non-league win over host DeSales Saturday in Columbus. Delaney Earl chipped in an assist while Karson Hill had a save in the Pioneer goal. Buckeye Valley’s Chloe Dawson and Zach Kreft pose with their trophies after winning individual titles at Saturday’s Tiffin Carnival.